The first successful lamp consisted of a slender glass tube fabricated of the hardest borosilicate glass, containing a hefty dose of around a pound of mercury which was sealed in under very high vacuum - no gas filling was employed in the Cooper-Hewitt lamps. Initially the lamp was suitable only for operation on direct current, the anode taking the form of a hollow iron cylinder, and the cathode being a large pool of mercury residing in a bulbous reservoir at the opposite end of the tube. The discharge length was fifty inches (1270 mm), the tube diameter one inch (25 mm), and the first model is illustrated in Figure 11. With a current of 3.5 Amps the lamp dropped 110 Volts across its length and drew a sizeable power of 385 Watts. The total light output was some 6,900 lumens when new, giving it a very desirable luminous efficacy of 17.9 lm/W. However owing to the great losses in the crude electrical control gear of the last century, the total system efficacy fell to 14.2 lm/W. Such a value was attained by gas-filled tungsten lamps of similar luminous flux in the 1920's, so it is easy to see why the Cooper-Hewitt lamp gradually lost its popularity. Its marginally longer life and superior lumen maintenance (Figure 12) helped it put up a strong fight though, and of course the high actinic value of the light ensured that it held a strong position in the photographic applications. It is of interest to note that the electrodes in this lamp underwent a continuous recycling process during operation. Of course most heat was developed at the liquid cathode which naturally evaporated. Whereas in any other discharge lamp the evaporated electrode material adheres to the bulb wall, blackening it and absorbing light, the unique liquid electrode in this lamp would continuously flow back to its home again. The imperfect lumen maintenance record is simply attributable to the wear on the iron anode, which of course was sputtered and wore away just as in any other modern discharge lamp. The mercury cathode was necessary since the heat generated here was required to vaporise enough of the metal, however it limited the maximum mercury vapour pressure to that attained at its boiling point, 357°C. In addition the discharge temperature was low, an estimated 500°C at its core and it rapidly diminished to only 125°C at the tube wall. Cooper-Hewitt was held back by the low pressure associated with this, and limited by the glass and anode materials of his lamp. Consequently it could never enjoy the improved efficacy and colour properties that are so easily attainable with new materials at our disposal today, although in later years following the work of Küch and Retschinsky, a much more efficient quartz Cooper-Hewitt style lamp was made. Westinghouse, the original financial backers of this lamp, undertook the manufacture of quartz products from 1908 onwards and sold them as sun-tan lamps for many years. Similar European products were offered from 1910 under the names of Bastian or Spanner lamps. A great many other style lamps were also offered. Principally these took the form of the standard 50-inch glass tube being bent into a U or M shape to make it more compact, but also an AC version was developed in later years. 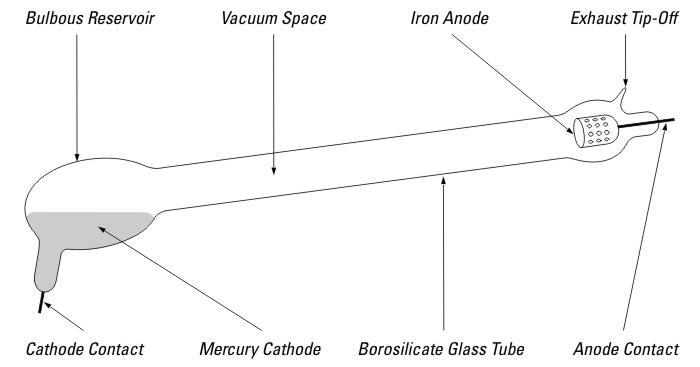 This was essentially a modification of the Cooper-Hewitt mercury rectifier tube, consisting of a single mercury cathode but two adjacent iron anodes, the arc alternating between these with the periodicity of the electricity supply. Specialised electrical control gear was necessary to run this lamp and provide means such that the current waveform lagged the voltage waveform, to ensure that the arc would never completely extinguish during the zero-voltage phase of the AC electricity supply. A further drawback of all of these lamps was that they contained mercury in great excess and the vapour inside the tube was always saturated. In other words a change in lamp temperature would result in more or less mercury being vaporised into the discharge, with a consequent change in the electrical characteristics of the discharge and the light output. 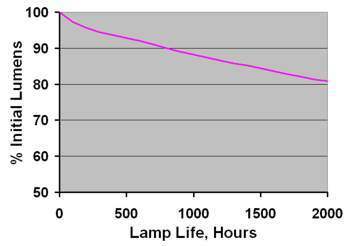 Such variations in ambient temperature or the supply voltage led to undesirable changes in lamp performance over a very wide range.